Attention, EPP fans: Vicki Bellino’s new book comes out on May 6! 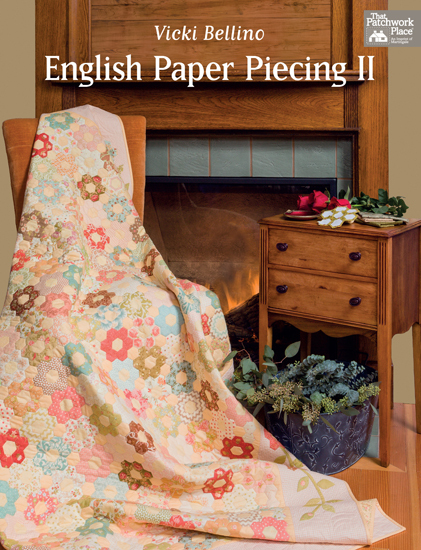 English paper piecing dates back to at least the early 1700s, but no worries—just like Vicki Bellino’s first book about EPP, her latest collection of vintage-vibe quilts relies on 21st-century techniques. Pre-cut papers, rotary cutters, glue pens, and sizing spray take this time-honored handcraft to a new level of ease and speed.Vicki turns hexagons, diamonds, Dresdens, and more into happy handwork. (Martingale, 2014) Challenge yourself with the quilt on the cover, made with a mind-boggling 2,031 hexies! Congratulations, Vicki! This entry was posted in Friends of Marcus Fabrics, Quilting Projects and tagged English paper piecing, EPP, Martingale That Patchwork Place, quilting, Vicki Bellino by Lisa Shepard Stewart. Bookmark the permalink.